Syria, Lattakia, 12 September, 2017– Shortly before his first birthday, Omar, now a determined 11 year-old boy, was diagnosed with cerebral palsy, a brain condition that affects his body’s movement and coordination. “There was no progress in his motor skills, when compared to other children his age,” says Hanadi, Omar’s mother, recalling the day she first sought medical opinion. “I was devastated thinking of how he would cope with his disability, and how will he embrace his future,” she adds. But Hanadi’s concerns for her son were rendered misguided. Omar grew up to be a confident, determined, and resilient adolescent. He always smiles, with sparkling eyes hoping for a brighter future. “I get my strength from him,” says Hanadi with a pride. “He makes everything easier; wherever he goes and whatever he does, it’s like he’s screaming to the world: ‘I’m here!’” she adds, glancing with joy at her son. With the help of regular physical therapy, by the time Omar was five, he was able to stand and walk with some assistance. He was able to use his hands to eat, play and draw. Yet, as violence escalated near their home in Harasta in Rural Damascus, the family was faced with another challenge – time to flee. Seeking safety, Omar, his three siblings and their parents moved to the coastal governorate of Lattakia. But with displacement came added financial burdens as Omar’s father lost his job. The family exhausted their savings, putting an end to Omar’s physical therapy, and risking his progress. “Omar’s movement regressed and he became drained,” says Hanadi. The family moved from one house to another, looking for neighbourhoods that have cheaper accommodation and schools accessible to Omar. “This is critical for us, because Omar always dreamt of learning,” says Hanadi. 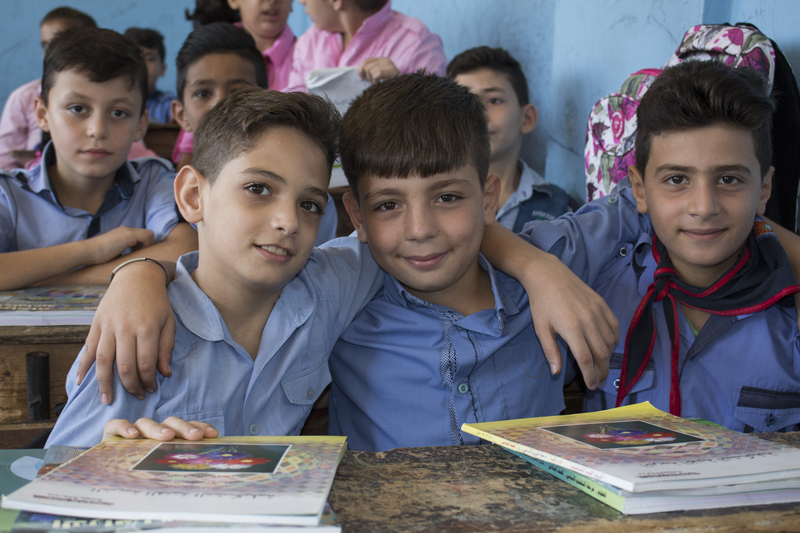 As Omar joined school shortly after moving to Lattakia, he was determined to not let anything get in the way of his learning. “Rain or shine, no matter whether he’s sick or tired, he never missed a day of school,” says Hanadi, admiring her son’s determination. The partial paralysis in Omar’s arms meant that he needs to rely more on listening and memorizing, rather than taking notes during classes. He was able to capture all teacher’s comments, securing excellent grades in school. “I got 94 per cent on my finals last year but this year I’m aiming for a full mark!” says Omar proudly. He started Grade 6 last week as the school year kicked off across Syria. In class, Omar refuses to be treated differently than his peers. “When he raises his hand to answer a question, I try to save him the effort by asking him to answer while seated,” says Ghalia, Omar’s teacher. “He insists on walking to the white board to write the answers every single time!” she continues. At his very young age, Omar loves to challenge himself to reach his full potential. One day, he heard about auditions to join a choir. Despite his family’s skepticism, he was shortlisted out of 45 other children. He never missed one rehearsal, and participated in a public concert, to which he invited his family. “When I first saw him on stage, I couldn’t control my tears,” says Hanadi with tearful eyes. His hobbies did not end there. Omar also practices his favourite sport – football. “I can stretch my arm to interrupt the ball or throw myself on the ground and block it!” says Omar cheerfully, having been chosen as a goal keeper by his friends. Omar dreams of becoming a successful businessman one day. “I like to challenge myself, that’s the only way I will advance in life,” he ends. Since May of this year, Omar’s family has been receiving UNICEF-supported cash assistance to help them better care for his special needs. The monthly allowance goes to his physical therapy sessions to improve his condition, and to purchase any special aid tools he might need, such as a walker or crutches. To help families cope with the financial burden of caring for a child with disabilities, UNICEF aims to reach almost 15,000 children and their families across Syria with regular financial assistance.